L-R: Officer Marcy Haaland and Sgt. Daniel Dorgan accept a $2,000 donation for the Fairhaven Police Deparment from Allen Days from the Fairhaven Road Race at the annual luncheon on Sunday, 11/4/18. Photo by Beth David. 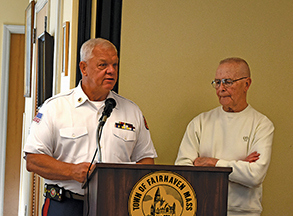 The Fairhaven Father’s Day Road Race donated more than $20,000 to 35 local organizations at its annual luncheon on Sunday, 11/4/18, at the Fairhaven Senior Center. 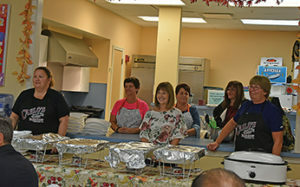 The group of about 50 enjoyed a hot buffet meal and door prizes. 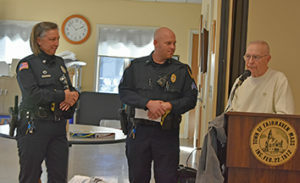 The first donation he handed out was $2,000 for the Fairhaven Police Department, which has, in the past, used the money for the PD exercise room and other department needs that are hard to budget for. Mr. Days said the FPD has been very supportive over the years, telling him at one point, “Don’t cap it because of us,” meaning the number of runners. Rick Seguin (LEFT) of the Greater New Bedford Marine Corps. League accepts a donation of $500 from Allen Days from the Fairhaven Father’s Day Road Race at the annual luncheon on 11/4/18. Photo by Beth David. Now the race routinely has more than 2,000 runners and the PD helps it all go smoothly as they run through town. Over the years, the race has donated about $250,000 to local organizations. Deputy Fire Chief Todd Correia said his department would probably use the money for a misting fan to help firefighters and the runners cool off. He also said they were looking into getting a privacy tent, so that runners who are treated after the race are not out in the open, and can get a little privacy. The Race also gave five $1,000 donations, eight $500 donations, and 19 $300 donations for a total of $20,700. 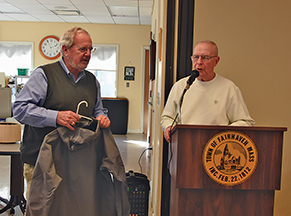 Bob Mitchell accepts a jacket in appreciation for his years of volunteering and sponsoring the Fairhven Road Race f from Allen Days at the annual luncheon on Sunday, 11/4/18. Photo by Beth David. Bob Dorgan of Boy Scout Troop 52 said his group would use the $300 donation to buy equipment. He said he expects to have 30 boys next year. “We’ve gotta outfit these guys,” he said. Mr. Days said they donate $300 every year to the Fairhaven Village Militia, which helps them with cannon fire to start the race. Selectboard member Bob Espindola also said a few words, noting that the race is a “signature event” in Fairhaven, and could not be done without the volunteers. He said there are a lot more options for runners now, but 2000 people still come to Fairhaven on Father’s Day. “Because it’s a really, really nice race,” said Mr. Espindola. Mr. Days also presented Bob Mitchell with a jacket for his many years of volunteering and donating to the race. The race is held on Father’s Day. Next year will be its 44th year. 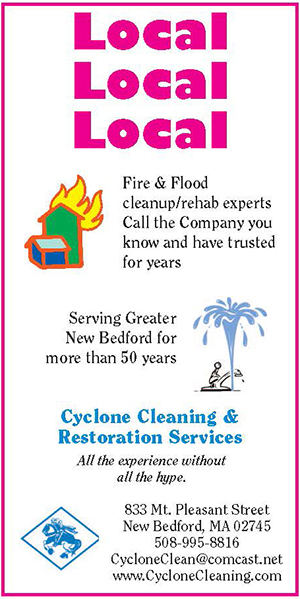 The food servers get a special shout-out at the annual luncheon of the Fairhaven Father’s Day Road Race on Sunday, 11/14/18 at the Fairhaven Senior center. Photo by Beth David.